A horse was injured and a rider left shaken when the animal was spooked on a country lane by a group of quad bike riders, who then chased it. 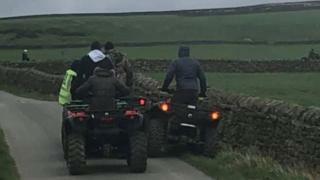 The rider was out on her horse from Draughton Riding Centre near Skipton, Yorkshire, on Sunday when the quads and a motorbike approached on a lane. The riding centre said the quad drivers revved their engines causing the horse to fall into a ditch and bolt. Police said "there could have been life-changing injuries". Yard manager Rebecca Knottage said two horses and riders had just left the riding centre when the group of quad bikes came up behind them. "One of the horses became startled and then the owners dismounted, took horses into the side to allow the quads to pass but they revved up again and were beeping," she said. "The horse fell into a ditch knocking the rider over and bolted up the road loose - then the quads set off after the horse." Ms Knottage said the quad riders "were chasing the horse and laughing about the entire thing. "I was sworn at by quad riders and the horse ran down the road, fell over and was covered in cuts. "The horse ran into the yard, which is just as well, because otherwise it would have ended up on the A65." North Yorkshire Police said it understood the vehicles travelled from the Bradford area and may have returned through Addingham and Ilkley. It could have "resulted in life-changing injury to the rider and horse", the force added. The rider and the horse have not been named by police or the yard.